Six British soldiers have been charged with beating up an off-duty police officer outside a New York City bar. One soldier is accused of second-degree robbery and five with third-degree assault in relation to the fracas early on Friday morning in Manhattan. The soldiers, Fijian nationals who serve in the Royal Regiment of Scotland, were on a rugby tour. Three of the soldiers were due to appear in court on Tuesday. The other three are expected in court this week. A confrontation occurred during an argument between the soldiers and the off-duty NYPD officer outside a bar in the Murray Hill neighbourhood. According to a police complaint seen by the BBC, Joeli Raduva, 34, Filipe Vunisarati, 24, and Mosese Kurulala, 27, "struck [the officer] repeatedly about the face and body with closed fists". Two others, Iliakini Raderua, 30, and Thomas Shute, 34, are accused of hitting the 30-year-old officer when he was on the ground or facing away from the soldiers. Ratu-Iosefo Yavala, 33, allegedly attempted to take the officer's mobile phone as he tried to report the incident to police, officials said. The officer suffered a broken nose, a swollen jaw, a large cut to his neck, bruises and a cut inside his mouth requiring stitches, according to the police report. 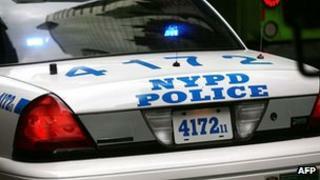 The NYPD told the BBC that one of the British soldiers had required minor stitches. It is understood that two of the servicemen received minor injuries from a knife during the altercation, although it is not clear who attacked them. The UK Ministry of Defence confirmed that six British Army soldiers had been charged in relation to an incident in New York. "This is a civil police matter and it would be inappropriate to comment further," the ministry's statement said. "All those who are found to fall short of the Army's high standards or who are found to have committed an offence under the Armed Forces Act are dealt with administratively (up to and including discharge) or through the discipline process, as appropriate."